Fruit Bats’ fifth studio album, Tripper, is the perfect disk to cool you off during these last few weeks of hot August weather. With shimmering synths that feel like cool water rippling over you, muted electric guitar, a small dose of acoustic, and the occasional gentle ringing bells, band leader and mastermind Eric D. Johnson produces some excellent, Sub Pop-y tunes. Though not taking a huge departure from his previous albums in terms of sound, Johnson is still able to create some wonderfully original, catchy songs that are much more intricately woven than immediately meets the ear. Appreciation of this album is definitely something that develops over multiple listens. Album opener “So Long” features a beautiful, synthy rippling effect and the waltz-y, acoustic “Picture of a Bird” closer is a very well-crafted, intricate piece. On the less-subtle side is “Dolly,” which is incredibly catchy and will, without a doubt, be plesantly lodged in your brain for days at a time. Lovely nature images hold a clear theme throughout the album, such as the track title “Shivering Fawn” (can I get a collective “aww” for that one?) and the Into the Wild-inspired “Tangie and Ray” track. A distinct 70’s vibe runs through several of the album tracks as well. Though sometimes more subtle, the band seemed to embrace the Bee Gees completely on “You’re Too Weird,” with upper register vocals and a corresponding video, which is a hilarious spoof on early 80’s music videos. 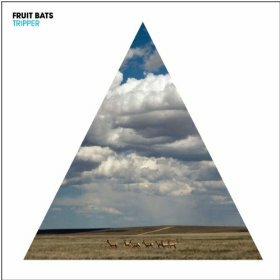 Absolutely worth checking out, Fruit Bats’ Tripper is a fantastic album and is recommended for fans of other Sub Pop bands that Johnson has played in before, like The Shins and Vetiver.